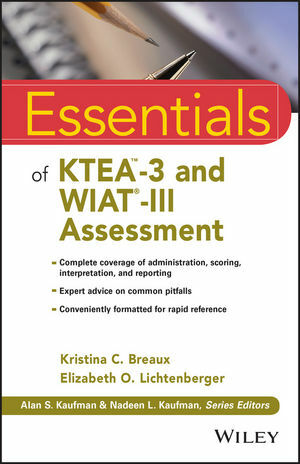 Written by expert authors Kristina Breaux and Elizabeth Lichtenberger, Essentials of KTEA-3 and WIAT-III Assessment offers up-to-date, comprehensive, step-by-step instruction in the accurate and effective use of the newest editions of the Kaufman Test of Educational Achievement (KTEA-3) Comprehensive Form, KTEA-3 Brief Form, and the Wechsler Individual Achievement Test (WIAT-III). Designed to provide in-depth information in an easy to use reference format, the book provides guidelines and tips for administration, scoring, and interpretation that go beyond the information provided in the test manuals. A complete guide is included for digital administration and scoring using Q-interactive, automated scoring using Q-global, and hand scoring. Essentials of KTEA-3 and WIAT-III Assessment makes score interpretation easier by explaining what each score measures and the implications of a high or low score. Learn how to increase the diagnostic utility of the KTEA-3 and WIAT-III by taking full advantage of their capabilities for error analysis, qualitative observations, and progress monitoring, and by pairing the results with measures of cognitive ability such as the WISC-V and KABC-II. Clinicians will find a helpful discussion of how these tests may be interpreted using either a CHC or neuropsychological approach to assessment. Case studies illustrate the use of these tests to respond to various referral concerns. Annotations within each case report provide a window into the mind of the examiner throughout the assessment process. This book provides a depth and breadth of understanding that is appropriate for all assessment professionals, regardless of their level of training or experience. Extensive illustrations, call-out boxes, and "Test Yourself" questions help students and clinicians quickly absorb the information they need. Essentials of KTEA-3 and WIAT-III Assessment is the clear, focused guide to using these tests to their fullest potential.